If you've ever watched a cooking program (and nowadays, who hasn't? ), you may have noticed the phenomenon of the "fantasy kitchen." Whatever the celebrity chef needs is always at his or her fingertips. Counters aren't cluttered with groceries or piles of paper. And you never see a mess after the cooking is done – just a lovely zoom-in on a perfect-looking meal. But in many real-life kitchens, it's easier to find the ingredients for chaos than to locate the necessary cooking supplies. Clutter-covered counters and crammed cupboards are enough to make even the most talented cooks lose their appetite and order takeout. 1. Evaluate and edit tools and supplies, including replenishables such as meal ingredients and cleaning products. If your kitchen drawers have become a jumble of strange, sharp objects that make finding or putting away utensils a hazardous experience, it's time to take action. Discard or donate items you never seem to use. Feeling overwhelmed about how and where to begin? Set a ticking timer for 10-15 minutes per drawer and start with the most accessible one. The same process applies to clearing out cabinets and cupboards. Don't expect to get it all done in one session; try going through one drawer or shelf at a time. You can even do this while talking on the phone. 2. Set up smarter storage systems. Store the most frequently used tools and supplies where they'll be easily accessible. For example, if you're not already storing dishes, cutlery and other regularly used items close to the sink or dishwasher, you'd be wise to do so – it usually saves time when putting things away. There are many excellent yet inexpensive drawer and cupboard organizers available that can help maximize space and minimize chaos. Some are designed to be used in specific areas, such as under the sink or alongside the fridge. Others are multifunctional for use in a variety of spaces. Just beware of organizing devices that are more clever than useful, or you'll end up adding to your clutter. 3. Maintain order through periodic purging. The price of organization is vigilance. 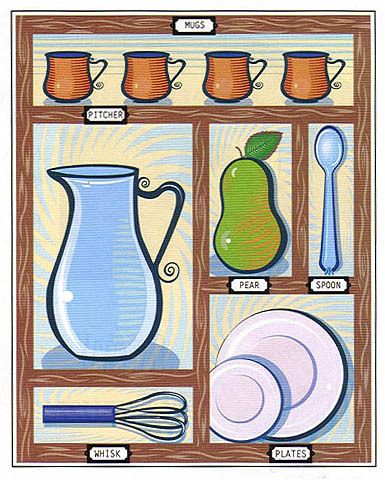 Therefore, it's a good idea to re-evaluate the contents of kitchen storage areas periodically. Keep your cooking and dining supplies and tools under control by periodically purging extras and replacing pieces that are worn out, damaged or just plain unappealing. Watch out for common clutter-causers such as rapidly multiplying mugs (often the result of a fondness for "free gifts"), countless quantities of bags and way too many ketchup packets from fast-food outlets. Set limits by deciding how many of each item it's reasonable to have on hand (for example, do you really need more than 100 grocery bags? ), and choose to stay within those limits –or suffer the chaos consequences. Harriet Schechter is founder of The Miracle Worker Organizing Service and author of three books, including "Let Go of Clutter." Her online advice column is at www.MiracleOrganizing.com.